There are many reasons to consider the 2017 Lincoln Navigator. Besides bold yet tasteful looks, this luxury SUV serves up best in-class towing, available Sync 3 with advanced voice controls and even a power rear liftgate. It combines rugged capability and modern amenities, creating an overall incredibly compelling package. You can fit up to 8 people in the Lincoln Navigator at a time. There's loads of legroom on all three rows, while the rear cargo area is large enough to fit plenty of luggage, or whatever else you need to transport. No matter which version of the SUV you select, a 3.5-liter twin-turbo GTDI V-6 engine provides smooth, even acceleration. It's rated at 380 horsepower and 460 lb.-ft. of torque, so when you step on the accelerator there's a big response. Thanks to direct injection, this vehicle consumes surprisingly little fuel. While two-wheel drive is standard, a Control Trac four-wheel-drive system is available. It helps with getting through snow-packed roads, or traversing down trails in the wilderness. You even benefit from improved handling when traveling on dry roads. With a peak towing capacity of 9,000 pounds, the Lincoln Navigator is the perfect option for taking along a boat, camper or whatever else you need for adventure. The standard 6-speed automatic transmission has a tow/haul mode, which is tuned to prevent the SUV from picking up too much speed when going down hills. When it comes to climbing steep grades, the mode keeps the engine right inside the optimal RPM range for peak power, preventing you from losing speed. Adding the optional continuously controlled damping improves handling and comfort, thanks to Lincoln Drive Control technology. Numerous sensors monitor the suspension, making automatic adjustments to combat body roll and other problems. Even the electric power-assisted steering is affected by Lincoln Drive Control, requiring light effort when traveling at low speeds, so you can maneuver through tight spots with greater ease. 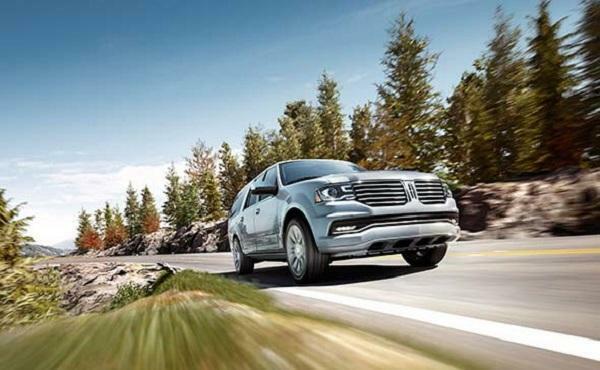 As a family vehicle, the Lincoln Navigator is a great option. It protects everyone by using advanced technologies designed to prevent accidents, and cushion any blow. AdvanceTrac with roll stability control teams up with a gyroscopic sensor, applying the brakes and cutting engine power as necessary to keep the SUV upright, such as when you take a corner too quickly. The vehicle structure is reinforced at key points, with crumple zones established to absorb impact forces. Six airbags are standard, including side curtains that cover all three rows of seats. There are plenty of luxuries loaded into the cabin, so everyone will loving riding around in the Lincoln Navigator. You can add a DVD system with dual 7-inch color monitors embedded in the backside of the front headrests. Because each screen has its own DVD player, and the wireless headphones feature dual channels, people in the second and third rows can watch two different things at the same time. Other amenities include heated and cooled front seats, heated second-row seats, power-deployable running boards, a power liftgate, a power-folding third row and many more. Experience the 2017 Lincoln Navigator by visiting us today.